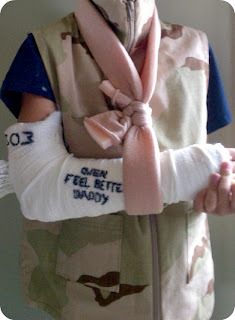 I still have a tiny bit of camoflage fabric from the bargain bin so I stitched up a cool vest for my nephew. This pattern came out in 2000 so the only place you'll find it is in the bargain bins at the thrift shop or at an online vintage pattern seller. If you do find it and you have a little man in your life, scoop it up. It comes together really easily, fits great, and looks pretty spiffy! 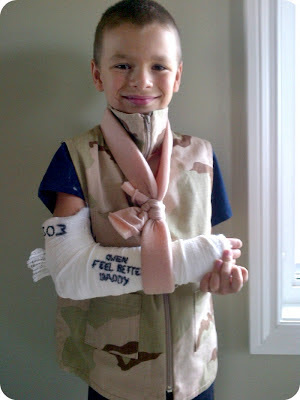 Looks like I made this one just in time...he had just broken his arm the day before and this was the perfect thing to wear over his brand new cast! I wish to him to be ok quickly!best wishes!!!! My daughter has spent the last 6 weeks in one. They are in most of my posts, since I sew for her majority of the time. It was awful. She cried when she couldn't play in the water with other kids...I hated it. This vest turned out awesome! I may have to add this to my outrageously long to-do list (for the boys). I had a cast my senior year of high school, with a broken ankle. Luckily boot-cut jeans just came into style. Worked perfectly over that hunk of plaster. What a fun vest! Thank you for linking up to Monday Funday!